This law doesn’t cover all Lugansk and Donetsk regions, but only some areas that are not under Ukrainian government control right now. It gives special status for those territories for 3 years. This law gives amnesty to rebels, it guaranties free use of the Russian language in social life, media and government structures. 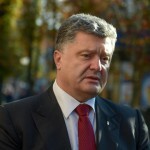 According to this law there will be elections to local authorities on the city levels, but not on regional level on December 7 2014 based on Ukrainian constitution. It means that people living in the cities on the territories controlled by terrorists will be selecting new deputies of city councils. And according to this law Ukrainian Parliament will have no right to cancel those elections. Deputies of the city council will have a right to select judges and prosecutors. City council will have a right to address to Cabinet of Ministers of Ukraine to sign deals on reconstruction of destroyed infrastructure of the cities. Ukrainian government provides all economic and social support to develop the territories and helps to rebuild destroyed industry and residential areas. 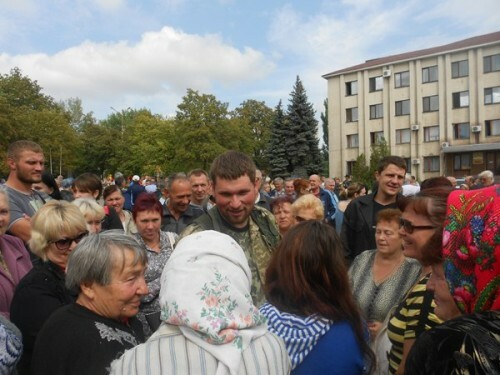 City councils will have a right to form “people militia” from Ukrainian people who are permanently living on those territories and the activity of such militia will be coordinated by local mayors. 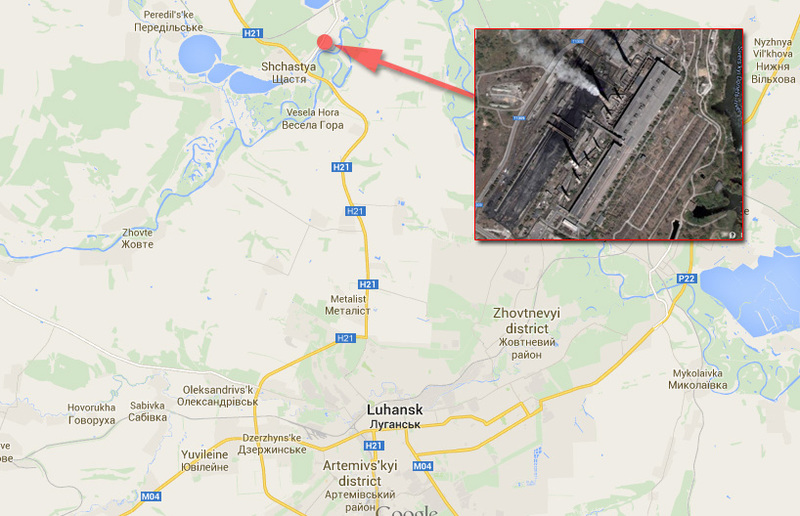 Despite the cease-fire agreement today at about 16:45 Russian Army started shelling at a power plant in Shchastya city located 20 km from Lugansk. They were using GRAD (multiple rocket launchers). The shelling continued for about one hour and a half. Few rockets hit the power plant and caused the fire. The North of Lugansk region is out of power now, including some cities controlled by Russian terrorists. 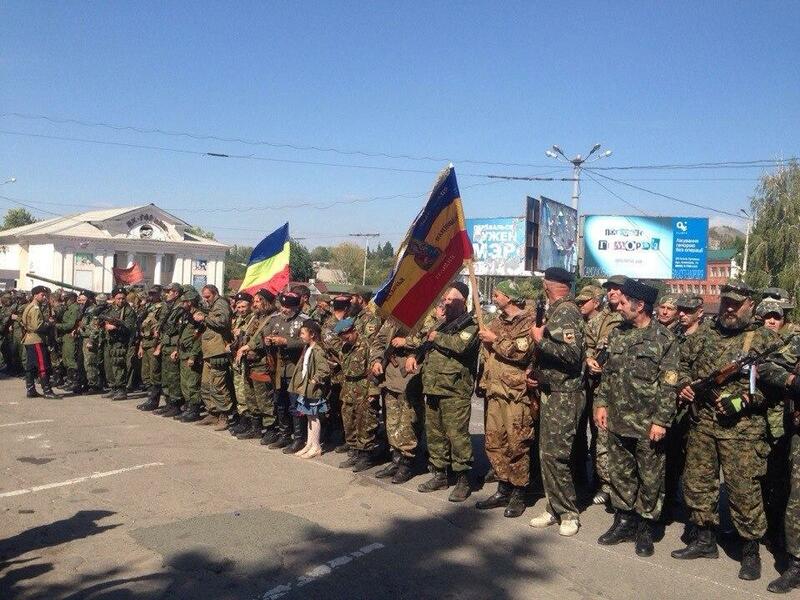 Shchastya city and power plant are under protection of Ukrainian Army, special battalion Aidar. There is no doubt that they were aiming at the power plant, yesterday a group of Russian special Army units was spotted near the area and they attacked positions of Ukrainian Army. So far the fire has been stopped, but it’s not clear yet how much damage has been done and if it’s possible to start the power plant. 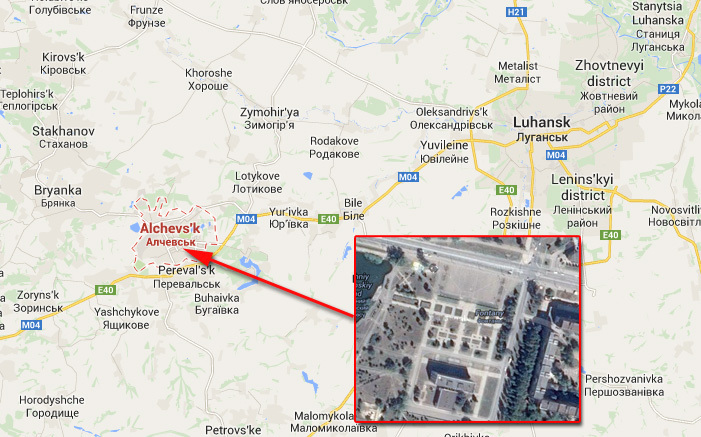 Some cities controlled by terrorists also got out of power, Alchevsk, Stakhanov, Bryanka and more. Here is the map where the power plant is located. This video was taken by Ukrainian Army soldiers who were in the basement of the building on the territory of the power plan during this artillery attack. 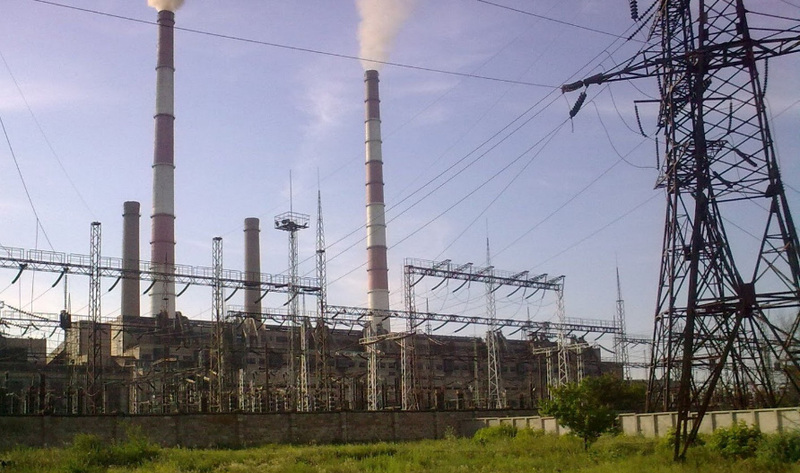 The photo of the power plant in Shchastya before the attack. Second “humanitarian” aid convoy has arrived to Lugansk. It was reported that 200 white trucks from Russia crossed the border and entered Ukraine at Izvarino border control check-point. Ukrainian customs or Red Cross were not allowed to inspect the trucks. 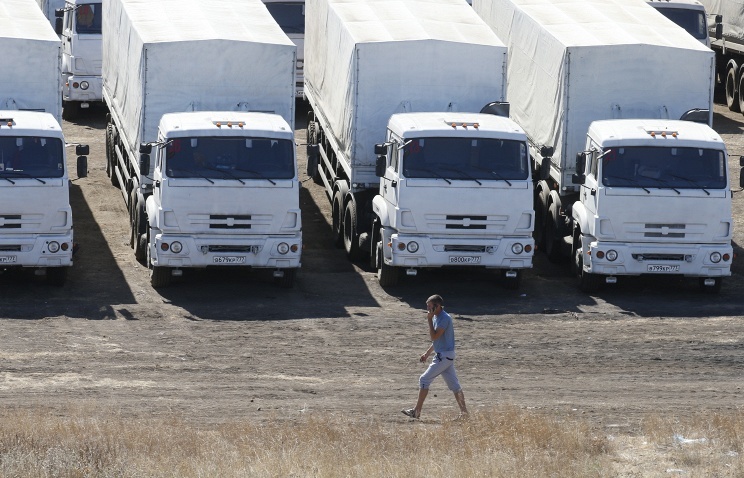 Russia is reporting that 70 of those trucks are already unloading in Lugansk. The convoy went on the road from Russian border to Lugansk followed by pro-Russian terrorists who control the city right now. Few days ago using cease-fire agreement Red Cross was trying to deliver real humanitarian aid to Lugansk, but they had to turn back 20 km from Lugansk as terrorists started shelling at that area where they were going. Nobody knows what really is inside Russian trucks, it may be just more military equipment and ammo for those Russian troops that are still in Lugansk. Last time it was also reported that on the way back Russian trucks were loaded with industrial equipment from some factories located in Lugansk and Krasnodon. On the video Russian trucks are moving through Molodohvardiisk town which is between Lugansk and Izvarino where the trucks crossed the border. This video shows what is inside the help that they give to people in Lugansk from that Russian humanitarian aid. There are 2 kilos of buckwheat, half a kilo of sugar, about 1 kilo of canned beef, 1 pack of tea and 10 liters of bottled water. State Border Guard Service of Ukraine reports that another Russian Army convoy has entered Lugansk Region on September 10 2014. 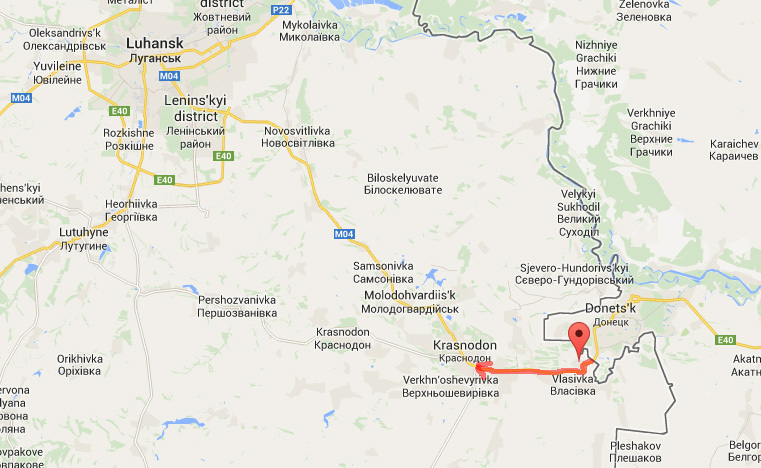 Russian troops crossed the border with Ukraine at Izvaryne and the column went to the direction of Krasnodon city. In total there were 12 tanks, 48 BTRs (armoured personnel carrier), 1 BRDM (armoured patrol car), 20 trucks loaded with ammunition, 8 trucks with soldiers, 4 Air Defense vehicles, 5 trucks with fuel. Obviously Russia is using cease-fire agreement for the rotation of the troops located in Ukraine and to send more reinforcement to local pro-Russian terrorists controlling territories in Lugansk and Donetsk regions. 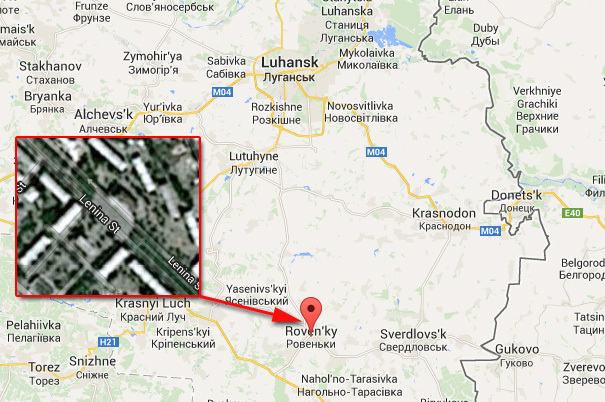 Terrorists were going to execute prisoners in Rovenki, Lugansk Region. Russian terrorists are using ceasefire agreement to show what they have and scare local population of the towns that they control. 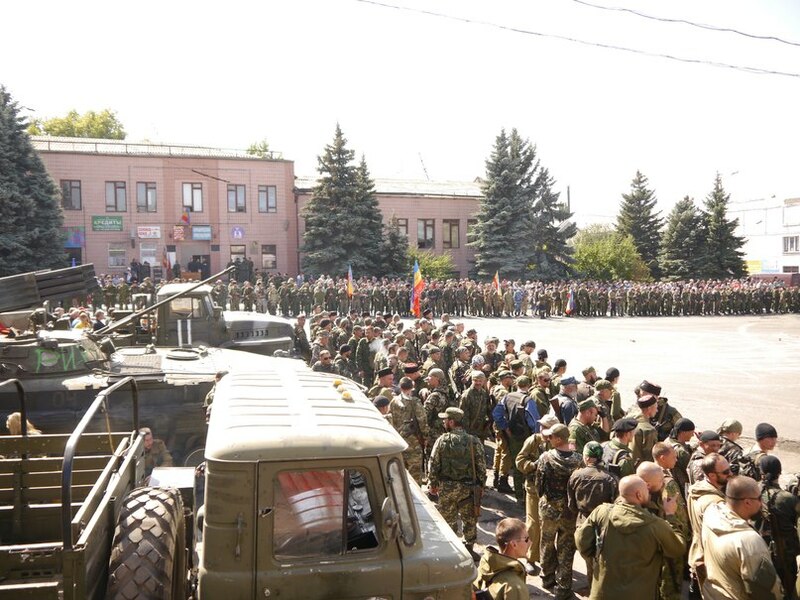 2 days ago they were on a big parade in Perevalsk and today some of them came on parade to Alchevsk in front of City Hall. Alchevsk is next to Perevalsk with a population about 100 000 people. Alchevsk is important industrial city 40 km from Lugansk. 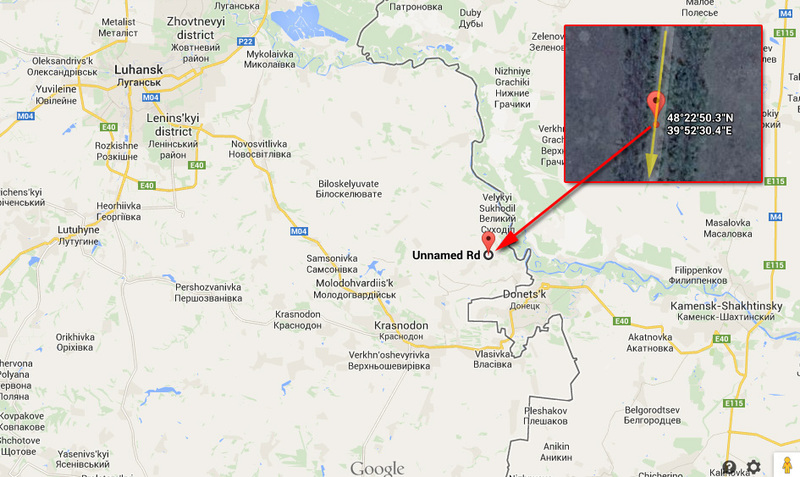 It’s on a straight road from Lugansk to Donetsk. 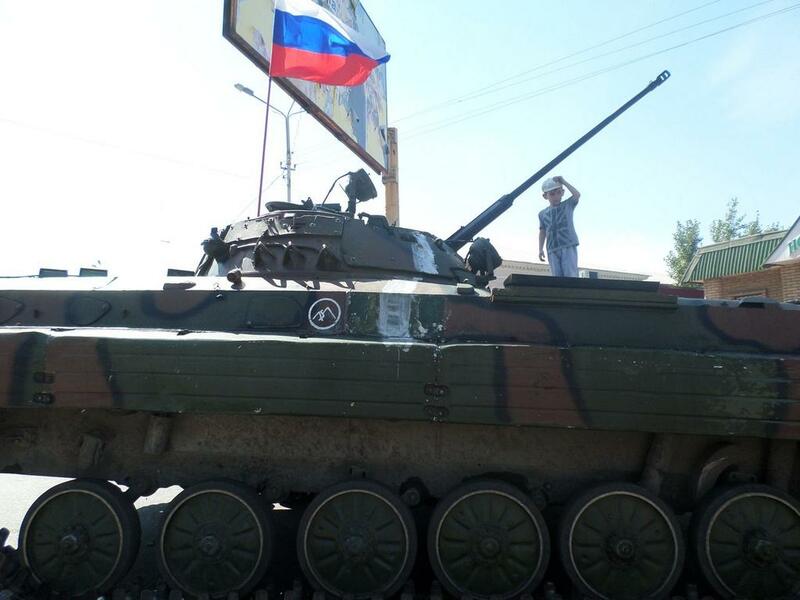 Russian terrorists in Perevalsk, Lugansk Region. 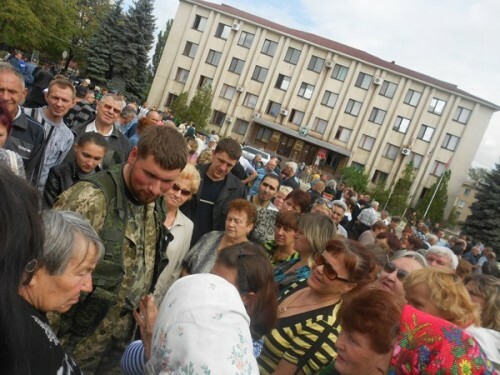 Today about 1000 Russian terrorists had a meeting in Perevalsk. That is a small town in Lugansk region which became a base for so-called Don Cossacks from the beginning of Russian invasion that started on Feb 27, 2014 in Crimea. “Don Cossacks” is a paramilitary organization that was given legal status in Russia. On their meeting they declared that they are going to fight against Ukraine and will take part in the attack on Ukrainian Army tomorrow. This terrorist group is responsible for kidnapping and keeping as hostages 4 OSCE observers for over a month in the same town of Perevalsk. 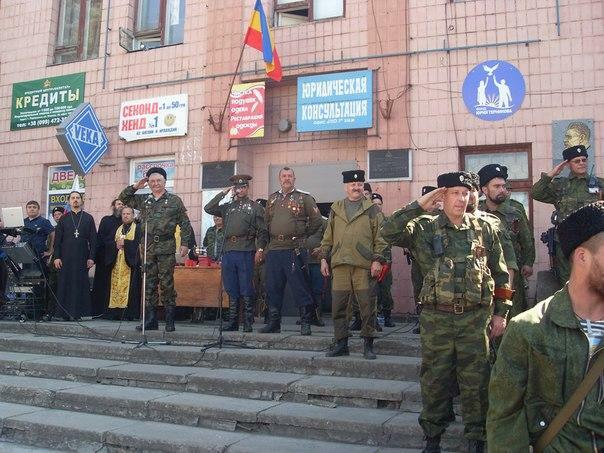 On the photos below you can see them under the flags of Russian Federation and using the flag of “Don Cossacks”. 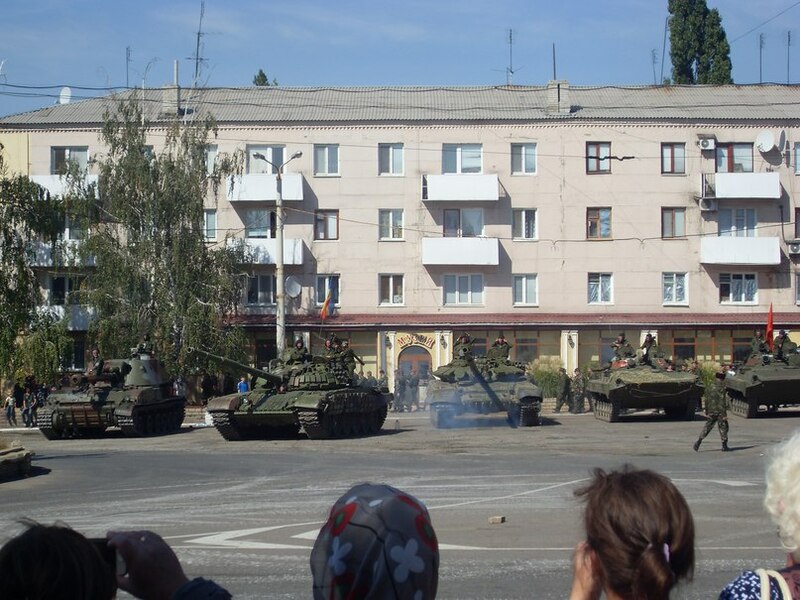 There were at least 15 tanks on the city square and other type of weapon including GRAD (multiple rocket launcher system). Obviously Russia is using ceasefire agreement now to regroup and reinforce pro-Russian terrorists who are fighting in Lugansk and Donetsk regions. 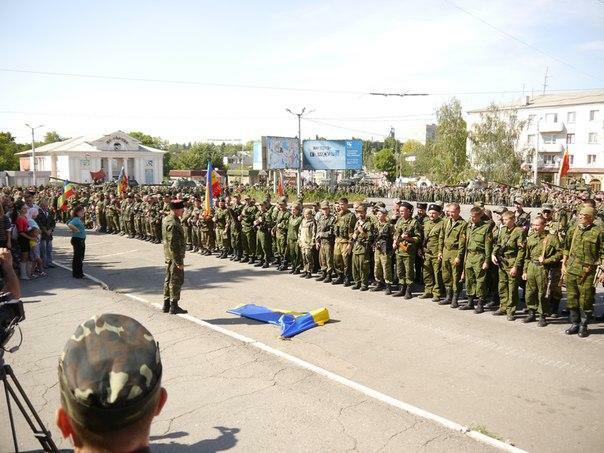 “Don Cossacks” took active part in Crimean campaign and were playing the role of local so-called self-defense units attacking Ukrainian military bases. Later Putin admitted that Russian military units were behind them. 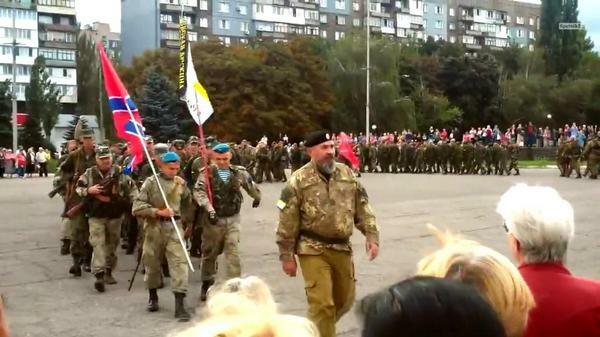 1st time “Don Cossacks” appeared in the East of Ukraine on May 3 2014, they arrived on few trucks to Antratsyt city in Lugansk Region, took control over the city and used it as their main base. Real humanitarian aid from Red Cross hasn’t been delivered to Lugansk today as pro-Russian terrorists broke ceasefire agreement and started shelling at the area where the convoy was supposed to go. 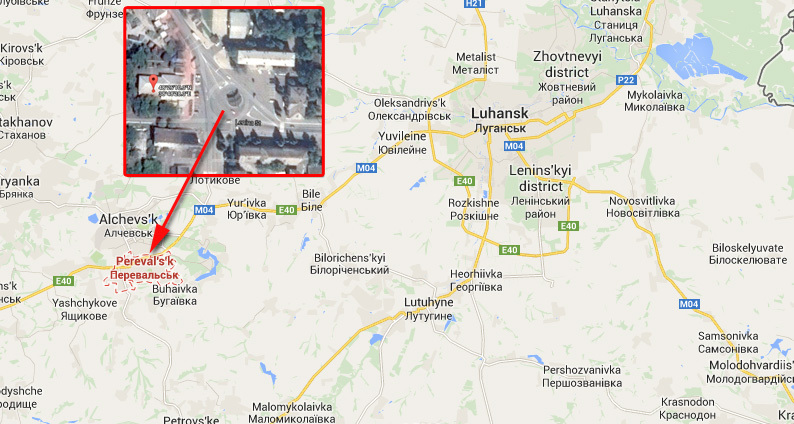 So they had to turn the trucks back at Stanytsia Luhanska just on the edge of Lugansk. It looks like only trucks from Russia are allowed to get to the city when nobody knows what is inside and what they take out when they leave. Aid much needed in east #Ukraine. We must be allowed to deliver it in safety, as soon as possible. One of the groups of “Aidar” volunteer battalion of Ukrainian Army forces got under attack yesterday between 5pm and 7pm. It is not clear yet if they have been attacked before or after ceasefire agreement. It’s reported that Russian soldiers who attacked them killed everybody who were in that group, 11 people in total. 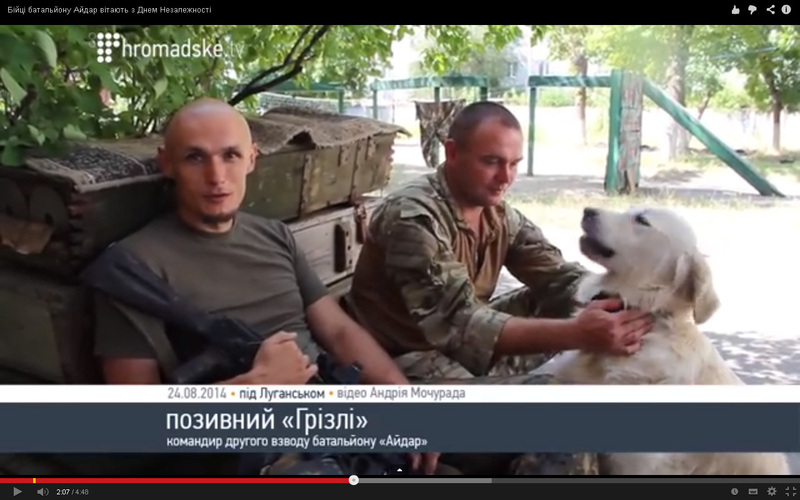 There was one of commanders, nickname “Grizli” among Ukrainian Army unit. They were attacked at Vesela Hora village which is close to Shchastya city controlled by Ukrainian Army, it’s about 20 km from Lugansk. “Aidar” battalion is formed only from volunteers, many of them went through the most tragic days of Maydan in Kiev when a lot of activists were killed by a team of snipers.